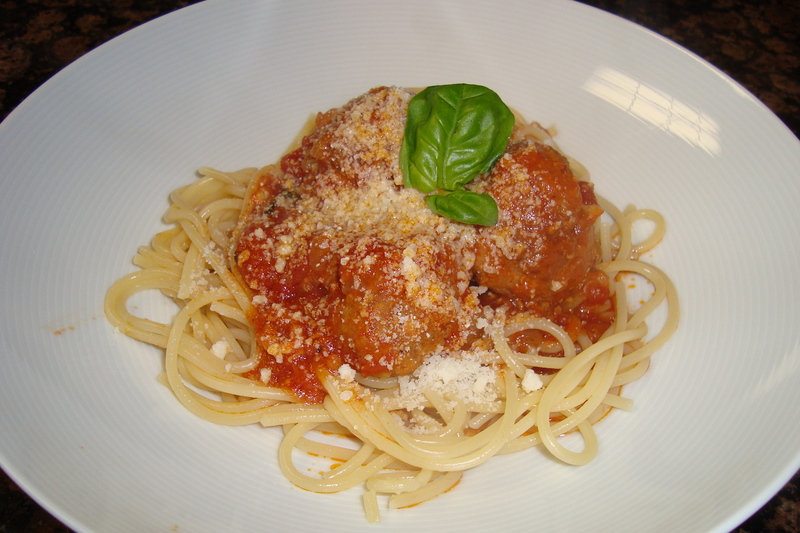 Paco requested spaghetti and meatballs for his first post-baseball game meal of the season. I had planned to make something lighter, so I decided to compromise with turkey meatballs. I baked them in the oven and started the sauce on the stove. Then I put both the meatballs and the sauce into the slow-cooker on high, so that they could simmer together for a few hours while I went to watch part of the game. It was amazing to come home to the smell of meatballs that have been simmering for hours! You could also simmer them on the stove together for 30 minutes – 2 hours. Preheat the oven to 375 degrees F. Drizzle olive oil over a baking sheet. In a large mixing bowl, combine the eggs, tomato paste, parmesan, bread crumbs, garlic, onion, salt, and pepper. Add the turkey meat, and combine with your hands. Do not overmix. Roll the meatballs into 1-1/2 inch balls, then place on the baking sheet 1 inch apart. After you have formed all of the meatballs, roll them around a bit in the olive oil. Bake for 15 minutes. Turn on the slow-cooker, using the High setting. In a medium-sized pot (or a large one if you are not going to use the slow-cooker), heat the olive oil over medium heat. Add the onions, garlic, and red pepper flakes, then season with salt. When the onions are soft, add the tomatoes, tomato sauce, tomato paste, and oregano. Bring to a simmer. Pour the sauce into the heated slow-cooker. When the meatballs have finished baking, add the meatballs to the sauce. Cover and simmer in the slow-cooker for 3 hours. During the last 30 minutes, add the basil. Serve over spaghetti with parmesan cheese.